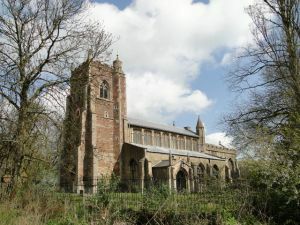 There are two churches in the village of Walpole, near King's Lynn. The current parish church is the magnificent Walpole St Peter, but standing a few fields distant is the church of St Andrew's, now declared redundant, and in the care of the Churches Conservation Trust. St Andrew's is an almost wholly Perpendicular building, a product of the late 15th century, but the history of the site goes back much further. Remains of a Roman building have been found here, and evidence of a much earlier medieval church. However, the large, spacious church we can see today is almost entirely 15th century. The church is composed of a west tower, chancel, and very tall nave with clerestory and side aisles. The embattled west tower is built of red brick, and at the base of the tower, built into the thickness of a buttress, is a peculiar little cell, or oratory, perhaps intended to be a roadside shrine for passers-by. The interior features a 15th-century font, and a Jacobean pulpit raised on a slender stone base. The pew ends have some very nice poppy-head carving, and the east window has some quite attractive Victorian-era stained glass. The only other really striking feature of the interior is the rather oddly mottled appearance of the nave arcade pillars; the result, we are told, of erosion caused by rising damp.